The Outdoor Education Center (OEC) is a 37-acre outdoor classroom that has myriad resources for students including a large greenhouse, organic garden, beehives, a research pond, wind turbines, solar panels, horse barns for therapeutic riding for students with special needs, farm to cafeteria program, sensory integration nature paths, exercise equipment, and athletic fields. While all Nanuet students have access to the OEC, the past five years the district has committed to using the OEC to enhance the learning of at-risk students. The project-based, hands-on programs target two at-risk populations, special education students, and English as a second language (ESL) students in grades K-12. HOW DOES THIS PROGRAM SEEK TO REMOVE THE BARRIERS TO ACHIEVEMENT? The programs run throughout the school year and in July to prevent regression of skills and to enhance access to peers. 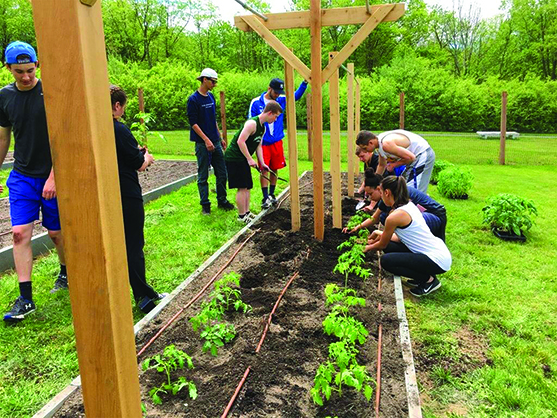 The summer program was created to provide an opportunity for ENL students to participate in an environmentally themed, project- based learning environment. These are students who wouldn’t otherwise have the opportunity to attend costly summer camps or travel for learning experiences. The program targets language acquisition and vocabulary development skills unique to ESL students. Background knowledge and vocabulary related to science and social studies topics allows students to develop deep knowledge about various environmental topics. Students also share a sense of responsibility for the garden and the pond. Further, they develop reading, writing, listening, and speaking skills through exploration, investigations, research, and observations of their environment. They conduct research on relevant environmental topics and create presentations and books to share their knowledge. Nanuet also runs a Life Skills program that consists of special education students who are academically unable to pursue a Regents Diploma and are pursuing a Skills and Achievement Commencement Credential. This program consists of Nanuet students and students from other school districts located within Rockland County, New York. The students focus on career and work-readiness skills through hands-on and work-based learning experiences. The OEC offers a structural and supportive program that helps students prepare for life after high school; build responsibility, self-esteem, trust; and apply learning. Student therapies including physical therapy and occupational therapy have been integrated into the program to assist students with negotiating the environment, handling resources, and engaging in sensory activities. The students in the program are all assessed using traditional academic measures such as local assessments and portfolios. At-risk students have also been granted internships at the OEC under the supervision of staff. Further, students and parents request to return to the program year after year. Alumni of the OEC ESL program and Life Skills program return to serve as mentors to younger students entering the programs for the first time. Several students have taken on internships at the OEC, which is an indicator of success in work-based learning and career-readiness skill development.